I've had the great pleasure recently of writing an article about bumblebee research that's going on in New Zealand. I stumbled upon the topic purely by meeting a new family to the neighbourhood - the dad is the chief scientist and a very smart, pleasant and interesting man. The mum's a lovely new friend to me, and their daughter to my daughter. It's been a happy turn of events. So even as we march through autumn, I've been thinking a lot about those big furry bees. Did you know they're mostly dead now? There might be the odd one around, but they die out in autumn and just the new queens from the summer's nest survive. The question is: how to get more of them around next summer? The varroa mite has wiped out wild honeybees, so unless you have beehives near you, or are even a beekeeper yourself (an admirable occupation), bumblebees are the bee's knees for you. Plus they rarely sting, which is a big deal for people like my daughter and me who blow up in pain and itchiness when we get stung. Although when they do sting, they can keep on stinging in a wasp-like fashion. I'm not an expert, but this is what I've learnt after speaking to a number of experts on this topic. There aren't many experts, because bumbles make only a little honey for themselves, needing no over-winter store like honeybees do. Humans have had no honey reward to force us to understand bumblebees very well. Firstly, when the queens emerge in spring - early spring, for some species (we have four species in NZ) - they need FLOWERS. The queens have been hibernating all winter, and they'll die if they can't adequately refuel. 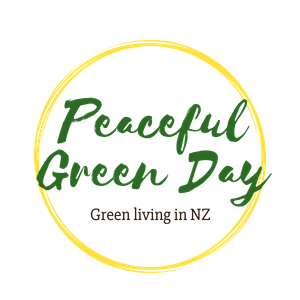 Think cottage-garden flowers and herbs, not purely NZ native plants, although they do go crazy feeding on some of them too. 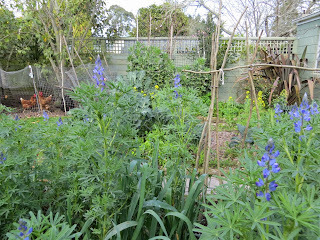 For the earliest spring flowers, I've got phacelia (also called tansy) and lupins, and our blueberry bushes. The great thing about phacelia and lupins is that once you've sown them, and let them flower and go to seed, you always have them popping up. The wonderful thing about blueberries is that - well, you get blueberries to eat. 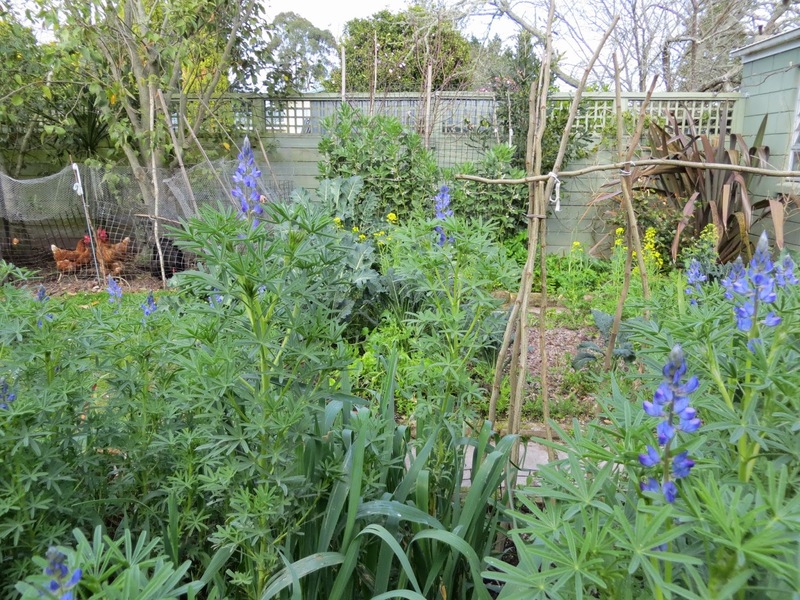 Lupins flowering last September in my early spring garden. A bumblebee queen I caught and put in a jar. She's drinking honey. The other thing the queens need is somewhere to make a nest - usually a hole in a ground, or a bank. Very tidy gardens aren't ideal, BUT you can try to make them a little house if you insist on clearing away the messy corners and general piles of vegetative rubbish that they might nest in. A link with a guide on how to make them a house is here. Despite cultivating (or not cultivating, as the case may be) messy corners myself, I will certainly be making a house like this in spring, and putting some house insulation inside it (here, you see, I have insider tips from scientists). The need a bit of fluff to nest in, and can't collect it themselves. It is said that they like old rodent holes, both for the hole and the fur left behind. Then they must be fed all summer! They can visit other gardens too, of course, so do not buckle under the pressure of keeping them alive yourself. After the queen has beefed up with nectar, and collected some pollen in readiness for her first eggs, the pressure comes off her a bit as her daughters (workers) do the collecting for her. Eventually a kind of crusty, messy nest develops, consisting of pile upon pile of loosely round, bulbous, waxy cells. At first the cells hold the babies, then they are recycled as honey pots. The workers collect nectar for themselves, pollen for the babies, and both for the queen. Provide some cottage garden flowers, and it will all happen effortlessly. There is a list of suitable flowers here, but note it is a British guide and some things like privet become terrible weeds here. (So do foxgloves, but sshhh, I guiltily have some growing). I am told reliably that fancy double-petaled garden centre punnets can be quite unsuitable for bees. They have old-fashioned tastes. By the way, get sowing now - how else will your phacelia and lupins be flowering by spring? They are so hardy that they can sprout in winter and resist frost, then flower madly in spring. There's no need to kneel down and make a little hole for each seed: just scatter the seeds freely. I am also about to sow some more poppies, although I don't have enough experience with them yet to know when they will flower. It's also a good time to poke some comfrey roots in the ground. Bumblebees love comfrey flowers, and the leaves are great for feeding compost heaps, making compost tea and feeding to chickens. It flowers quite a bit later - summer rather than spring - but keeps flowering for months and months. My comfrey patch has only just stopped flowering. Oh, and borage. It reloads with nectar extremely fast so the bees can harvest it repeatedly within an hour. There, I must stop at that. The chances of bumblebees using the bee house are quite slim, but if it works for me I will be thrilled and will definitely report it here, complete with photos.